In reality, the stock pond had been used for four years by the Johnson’s cattle and horses, and other wild animals have been known to drink from and use the pond. Fish have taken up residence in the pond, and that supplies food for other animals in the area. Birds and moose regularly visit the pond as well. These are all indications that the stock pond is good for the local environment. The Clean Water Act gives the EPA jurisdiction over navigable waters. However, the Johnson stock pond not only is not navigable, but also, it does not drain into a navigable waterway. The Johnson pond drains into a man-made ditch that is used for agricultural purposes. 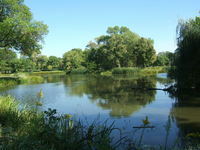 With the help of some good lawyers who donated their time, the Johnson family was able to negotiate the EPA’s demands down to an agreement whereby the Johnson’s will pay no fine, they can keep the stock pond, and they must plant a few willow trees and install a fence around part of the pond. This unreasonable, overbearing and absolutely ludicrous enforcement effort by the EPA for a small pond on private property used for livestock purposes is not only absurd, it’s scary. It is yet another example of a federal agency gone wild. The Johnson family was lucky enough to have legal assistance to fight the EPA behemoth. Will the next family attacked by the EPA be as lucky?